The discovery of a remarkable 15-million-year-old Australian fossil limestone cave packed with even older animal bones has revealed almost the entire life cycle of a large prehistoric marsupial, from suckling young in the pouch still cutting their milk teeth to elderly adults. In an unprecedented find, a team of University of New South Wales [Sydney Australia] researchers in has unearthed from the cave floor hundreds of beautifully preserved fossils of the extinct browsing wombat-like marsupial Nimbadon lavarackorum, along with the remains of galloping kangaroos, primitive bandicoots, a fox-sized thylacine and forest bats. 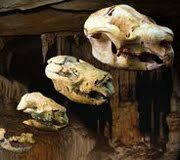 By comparing the skulls of 26 different Nimbadon individuals that died in the cave at varying stages of life the team has been able to show that its babies developed in much the same way as marsupials today, probably being born after only a month's gestation and crawling to the mother's pouch to complete their early development. Details of the find at a site known as AL90 in the famous Riversleigh World Heritage fossil field in Queensland are published in the Journal of Vertebrate Paleontology, by a team led by Dr Karen Black, of the UNSW School of Biological, Earth and Environmental Sciences. The research was supported by the Xstrata Community Partnership Program North Queensland and the Australian Research Council. "This is a fantastic and incredibly rare site," says Dr Black. "The exceptional preservation of the fossils has allowed us to piece together the growth and development of Nimbadon from baby to adult. So far 26 skulls - ranging in age from suckling pouch young and juveniles right through to elderly adults - have been recovered, as well as associated skeletons. "The animals appear to have plunged to their deaths through a vertical cave entrance that may have been obscured by vegetation and acted as a natural pit-fall trap. These animals – including mothers with pouch young - either unwittingly fell to their deaths or survived the fall only to be entombed and unable to escape. The site is also scientifically important because it documents a critical time in the evolution of Australia's flora and fauna when lush greenhouse conditions were giving way to a long, slow drying out that fundamentally reshaped the continent's cargo of life as rainforests retreated. Dr Black notes that the Nimbadon skulls also reveal that early in life, the emphasis of its growth was on the development of bones at the front of the face, to help the baby to suckle from its mother. As it grew older and its diet changed to eating leaves, the rest of the skull developed and grew quite massive by way of a series of bony chambers surrounding the brain. Team member Professor Mike Archer says: "Yet we found that its brain was quite small and stopped growing relatively early in its life. We think it needed a large surface area of skull to provide attachments for all the muscle power it required to chew large quantities of leaves, so its skull features empty areas, or sinus cavities. Roughly translated, this may be the first demonstration of how a growing mammal 'pays' for the need to eat more greens - by becoming an 'airhead'. "The abundance of Nimbadon fossils also suggests that they travelled in family groups or perhaps even larger gatherings: it's possible that this also reflects the beginning of mob behaviour in herbivorous marsupials, such as we see today in grey kangaroos."